Prior to being signed, he was active under the name Gloss as an underground rapper .As part of the hip hop crew D-Town in 2010, he released a song titled "518-062" in commemoration of the Gwangju Uprising . Originally joining the company as a music producer,Suga trained under Big Hit Entertainment for three years alongside members J-Hope and RM . He made his debut as a member of BTS on Mnet 'sM Countdownwith the track "No More Dream" from their debut single album2 Cool 4 Skool.He has produced and written lyrics for a variety of tracks on all of BTS' albums. On the record, he discussed matters such as his struggles with depression and social phobia.Fuse TV rated it as one of the top twenty mixtapes of 2016. Suga also received the " Hot Trend Award " for his work on the track. Billboard 's World Albums Chart , number five on the Heatseekers Albums chart, and number 74 on the Top Album Sales chart. It also caused Suga's solo alias, Agust D, to reach number 46 on the Emerging Artists chart for the week of March 3. The foundation of his lyrics involve themes that are "full of dreams and hope," conceived with the intent of his music becoming "many people's strength. "He cites Stony Skunk and Epik High as his inspirations to pursue hip hop music. Particularly, he credits the former's reggae -hip-hop hybrid albumRagga Muffin(2005) and its title track for igniting his interest in the genre, calling it "completely different" from mainstream music. 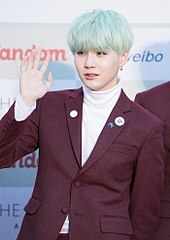 Suga at the Gaon Chart Awards in 2016. Dark & Wild What Am I To You? Park, Han-bit (2016-10-07). 방탄소년단의 슈가, 민윤기, 혹은 Agust D . Grazia Korea (in Korean). Seoul Media Group. Retrieved 2018-01-19. Jang, Eun-kyung (2015-04-30). [더스타프로필] 방탄소년단 슈가 "민피디는 음악장비를 수집합니다" . The Star (in Korean). Chosun Ilbo Company. Retrieved 2018-01-19. Park, Su-jeong (2014-08-19). 기다렸다, 방탄소년단① 정규 1집이 되기까지 일곱 소년의 성장기 –데뷔 전 . 10asia (in Korean). Korea Entertainment Media. Retrieved 2018-01-19. Han, Mi-rae (2015-11-12). 방탄소년단 슈가가 고2때 만든 5ㆍ18노래 화제 . Seoul Economy Daily (in Korean). Naver. Retrieved 2018-01-19. There is a behind story of naming for BTS(방탄소년단! 너 이름이 뭐니? )ㅣYamanTV Ep.23 (video) (Variety television show) (in Korean). YouTube: Mnet K-POP. Jun 22, 2015. Event occurs at 1:49. Retrieved Mar 5, 2018. 방탄소년단(BTS) "팬들이 함께 노래부르는 모습, 최고의 행복" (풀영상) / SBS (video) (News) (in Korean). YouTube: SBS News. Jun 3, 2018. Event occurs at 7:30. Retrieved Jun 3, 2018. Bennett, Colette (2016-05-12). "How BTS is changing K-pop for the better". dailydot. Retrieved 2018-01-19. Kim, Ji-ho (2016-08-17). "[Starcast] "My name is, AgustD"... 'Suga' to rap about the real Min Yoon-ki". Naver Starcast. Naver. Retrieved 2018-01-19. "BTS' Suga Addresses Depression & Cost of Fame on 'Agust D' Mixtape". Billboard. Nielsen Holdings. 2016-08-16. Retrieved 2018-01-19. Benjamin, Jeff (2016-12-16). "The 20 Best Mixtapes of 2016". Fuse. Retrieved 2018-01-19. "수란 "데뷔 첫 음원 1위 감격..슈가·창모에 무한 감사"" [Sura "I am deeply impressed by the first record of my debut .. Thanks to Sugar and Changmo forever] (in Korean). Naver. 2017-04-27. Retrieved 2018-01-19. "국내 대표 음악 차트 가온차트!". gaonchart.co.kr. Retrieved 2018-01-19. Mathew, Ilian (2017-12-05). "Melon Music Awards 2017: Best Artist Of The Year goes to EXO; Complete winners list". International Business Times. Retrieved 2018-01-19. Jones, Alan (2018-02-26). "International Charts Analysis: Black Panther OST comes charging out of the blocks". Music Week. Retrieved 2018-03-01. "Emerging Artists". Billboard. Archived from the original on 2018-03-03. Retrieved March 1, 2018. "Heatseekers Albums". Billboard. Archived from the original on 2018-03-03. Retrieved March 1, 2018. "World Albums". Billboard. Archived from the original on 2018-03-03. Retrieved March 1, 2018. "Top Album Sales". Billboard. Archived from the original on 2018-03-03. Retrieved March 5, 2018. Jung, Alex E. (February 15, 2018). "BTS Speaks Out In Seoul: The K-Pop Megastars Get Candid About Representing a New Generation". Billboard. Retrieved April 7, 2018. "[스타와치]생일맞은 방탄소년단 슈가, 보육원 39곳에 한우 기부한 사연". newsen.com. Retrieved 13 March 2018. "Songs Registered Under Suga". komca.or.kr. Retrieved 2018-01-19. Herman, Tamar (2017-06-30). "Get To Know BTS: Suga". Billboard. Nielsen Holdings. Retrieved 2018-01-19. "BTS". An an. Japan: Magazine House. June 14, 2016. Park, Su-jeong (2013-10-15). 방탄소년단, 네 꿈은 뭐니? (인터뷰) . 10asia (in Korean). Korea Entertainment Media. Retrieved 2018-01-19. Benjamin, Jeff (2016-08-16). "SUGA TAKES THE SPOTLIGHT WITH 'AGUST D' MIXTAPE: WHY YOU SHOULD KNOW THE BTS RAPPER'S ALTER EGO". fuse.tv. Retrieved 2018-01-19. Kim, Hyun-seo (April 20, 2018). "방탄소년단(BTS) 슈가, 한국음악저작권협회 정회원 승격…'정회원 기준은?'" [BTS' Suga, a member of the Korea Music Copyright Association (KOFIC), ' What are the criteria for full membership? ']. Top Star News (in Korean). Retrieved April 20, 2018. "방탄소년단 슈가·수란, 핫 트렌드 상 수상" (in Korean). Sports Seoul. 2017-12-02. Retrieved 2018-01-19. "Billboard Japan Hot Album Chart-March 05, 2018". Billboard Japan. Retrieved March 10, 2018. "Agust D". Soundcloud. soundcloud. Retrieved 2018-01-19. 2016년 42주차 Digital Chart . Gaon Music Chart (in Korean). Korea Music Content Industry Association. Retrieved 2018-01-19. "World Digital Songs". Billboard. 2016-10-29. Retrieved 2018-01-19. "INTRO: 화양연화 The Most Beautiful Moment In Life". genius.com. Retrieved 2018-01-19. "2015 Gaon Download Chart – Week 19". Gaon Music Chart (in Korean). Retrieved 2018-01-19. "2015 Gaon Download Chart – Week 20". Gaon Music Chart (in Korean). Retrieved 2018-01-19. "2016년 10월 Download Chart". Gaon Music Chart (in Korean). Korea Music Content Industry Association. Retrieved 2018-01-19. "2017년 07주차 Download Chart". Gaon Music Chart (in Korean). Korea Music Content Industry Association. Retrieved 2018-01-19. "Gloss 518-012". soundcloud.com. Retrieved 15 March 2018.